126 Marlborough is located on the south side of Marlborough, between Clarendon and Dartmouth, with 124 Marlborough to the east and 128 Marlborough to the west. 126 Marlborough was built ca. 1868 for Charles William Freeland for speculative sale, one of eleven contiguous houses (110-130 Marlborough) built on a parcel 198 feet wide which he purchased from the Commonwealth of Massachusetts on October 26, 1868. Click here for an index to the deeds for 126 Marlborough. On September 15, 1870, 126 Marlborough was purchased from Charles Freeland by Mary Elizabeth (Fiske) Dickson, the wife of cotton buyer and broker Brenton Halliburton Dickson. They previously had lived at 57 Chestnut. They also maintained a home in Weston with Mary Dickson’s mother, Hannah Rogers (Bradford) Fiske, the widow of Augustus Henry Fiske. The Dicksons continued live at 126 Marlborough during the 1896-1897 winter season. Their younger son, Edward Fiske Dickson, died in March of 1897. 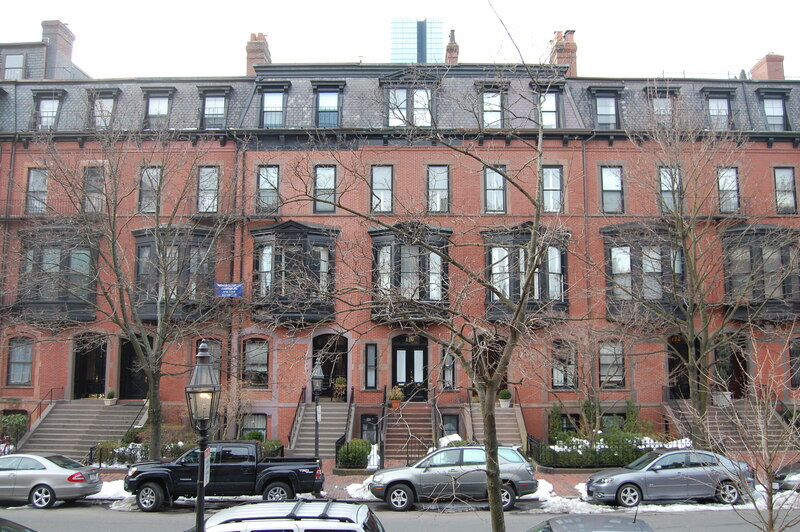 By the 1879-1898 season, the Dicksons and their older son, Brenton Dickson, Jr., in business with his father, had moved to the Hotel Brunswick (southeast corner of Clarendon and Boylston), and by the next season they were living at the Hotel Vendôme. The Dicksons continued to own 126 Marlborough but it appears to have been unoccupied for the next six years. It was not listed in the 1898-1904 Blue Books, nor was it enumerated in the 1900 US Census. On February 27, 1905, 126 Marlborough was purchased from Mary Dickson by cotton mill treasurer Charles Dale Turnbull. He and his wife, Maria (May) (Peck) Turnbull, made it their home. They previously had lived at 275 Clarendon. They also maintained a home in Nahant. From about 1914, they were joined by Charles Turnbull’s mother, Mary Bliss (Dale) Turnbull, the widow of Charles Nesbit Turnbull. She previously had lived at the Hotel Hamilton at 260 Clarendon. She continued to live at 126 Marlborough until her death in May of 1932. Maria Turnbull died in January of 1936. Charles Turnbull continued to live at 126 Marlborough until his death in November of 1940. On February 28, 1941, 126 Marlborough was purchased from Charles Turnbull’s estate by Alice (MacKinnon) Cross, the wife of Norman Pearson Cross. They previously had lived at 1140 River. He was a police sergeant in the traffic division. In May of 1943, Alice Cross applied for (and subsequently received) permission to convert the property from a single-family dwelling into a lodging house. They continued to live there in 1944, but had moved to 370 Longwood by 1945. On October 9, 1944, 126 Marlborough was acquired by Marie A. St. Antonopoulos, the wife of Anastassios St. Antonopoulos. He was the Greek Consul, appointed in mid-1944; he previously had been assigned to the Greek Embassy in Washington DC, where he and his wife had lived. 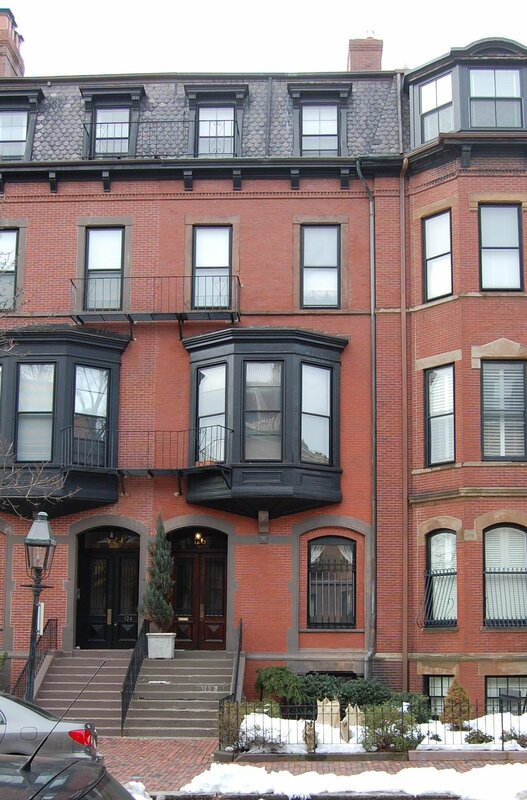 They made 126 Marlborough their home in Boston. He remained Greek Consul until 1946, when he was reassigned elsewhere. On May 23, 1946, Marie St. Antonopoulos transferred 126 Marlborough into both of their names. They continued to own the property and lease it to others. By 1950, 126 Marlborough was the home of Mrs. Ray (Rae) V. Hall, who operated it as a lodging house. She previously had been a lodger at 114 Marlborough. 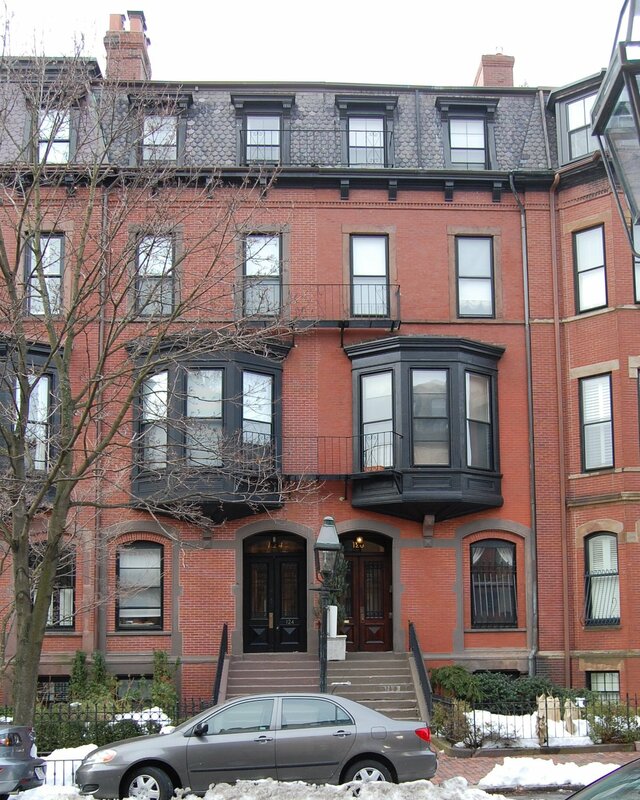 She continued to live at 126 Marlborough until the mid-1960s. On January 19, 1965, 126 Marlborough was acquired from Anastassios and Marie St. Antonopoulos (by then residents of Athens, Greece) by Mrs. Denise Powers Donovan. the former wife of Walter T. Donovan. 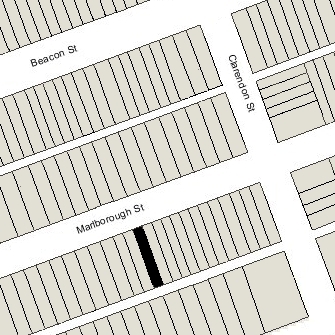 She owned and lived at 124 Marlborough, where she operated a lodging house. On June 27, 1967, 126 Marlborough was acquired from Denise Powers Donovan by Miss Mary Angela Cocuzzo and Miss Nancy A. Casey. They owned several Back Bay properties which they operated as lodging houses. On September 14, 1967, 126 Marlborough was acquired from Mary Cocuzzo and Nancy Casey by Dr. Maurice Machado Osborne, Jr, and his wife, Sydney (Watkins) Osborne. Dr. Osborne was director of health services and an associate professor of pediatrics at the New England Medical Center. They remodeled the house and occupied it as a single-family dwelling, although it appears to have remained a lodging house in the Building Department records. On June 15, 1972, they transferred the house into Sydney Osborne’s name. On May 24, 1973, 126 Marlborough was acquired from Sydney Osborne by Herman J. Beckstoffer, Jr., and his wife, Andree R. Beckstoffer. On April 13, 1988, 126 Marlborough was purchased from the Beckstoffers by Gene A. Herbster and his wife, Eileen King-Herbster. In May of 1988, they applied for (and subsequently received) permission to convert the property from a lodging house back into a single-family dwelling. On May 18, 1994, 126 Marlborough was purchased from the Herbsters by Anthony L. Craig and his wife, Jane E. Craig.